Grades 6-12. Love anime or just want to learn more about it? Join us in watching and discussing different anime videos at each session. Teens share opinions about the Young Adult section of the library. The recommend purchases and help create and plan youth programming. This group also can earn volunteer hours. 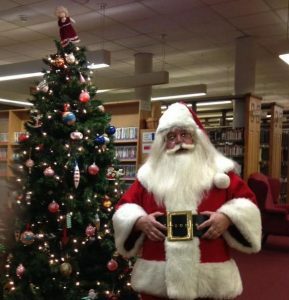 Enjoy Christmas treats, ornament making craft, a special holiday concert performed by the Sandwich High School Band, and a certain special jolly-faced man in red. Join in on the fun with your preschooler as we read, dance, sing, play, and learn! Story time is geared towards children aged 2.5 years old to 5 years old. Registration is required. Grades 6-12. We challenge you to create the best gingerbread house. We’ll provide the materials, you bring the creativity. Ages 3-8 years old. Bring a teddy bear to this fun storytime. Afterwards, teddy bears will sleep overnight at the library. Pick up your bear on Saturday between 9-10 a.m. You’ll find out if your bear was naughty or nice. Grades 6-12. Make a holiday ornament for your tree. Perfect to keep for yourself or give as a gift. Stop by the Little White School Museum between 12:30 and 3:30 p.m. and make holiday decorations that you can take home and share. These Victorian themed crafts will add a special touch to any celebration. Children must attend with an adult. Ages 3 and up. Join us for Christmas Tea. We’ll have delicious treats, a craft to take home, books to share, and of course, tea. For independent students in grades 1-5 only. Call (630) 552-2025 to register. Kids from 9-16 years old can read any chapter book they like and then talk about it at Book Club. We also have ice cream while listening to the other kids talk about the books they have read. Registration and fee are required. Learn about the animals that call Red Oak their home- specifically, mice! Registration fee goes towards helping take care of the animals. Children must be accompanied by a registered adult. Ages 3 and up. Listen to an adapted version of the Nutcracker story and participate in holiday themed crafts and activities to celebrate the season. Children must be accompanied by an adult. Explore letter sounds and handwriting in a fun, interactive, and multisensory way. We’ll have a variety of phonics stations for self-paced exploration. Targeted to ages 3-6, with an adult. Call (630) 552-2025 to register. Bring the family in to the library to enjoy a classic holiday themed movie. Refreshments will be included. No registration required. This program consists of reading books and doing a fun related craft, for ages 4-5 who can work independently. Sorry parents, kids only. Registration and fee are required. This is the same class as Afternoon Read, just a different title and time. This week, the film “White Christmas” will be shown on the big screen at the historic Paramount Theatre for just $1. Concessions are available. Doors open at 6:15 p.m. For more information, visit www.paramountaurora.com. Come celebrate the season as we tour different homes in the area to see their Christmas light displays. Take the tour and be the judges of the FVPD’s Christmas Lights House Decorating Contest. Starts at Prisco with hot cocoa and cookies. In the event of bad weather, back up date will be Tuesday, Dec. 19. Members of the Fox Valley Genealogical Society will assist patrons in researching their family history with the library’s local history and genealogy resources at the Oswego Campus. No registration is required.